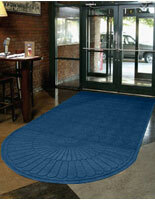 These blue anti-static entry mats are great for lobby floors because they absorb dirt and water with plastic fibers. 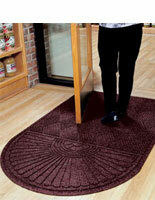 To clean the fabric on the area rugs, simply use a hose or a vacuum cleaner. 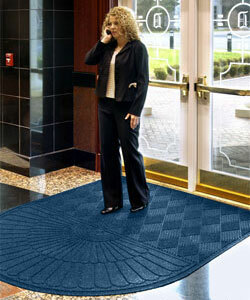 The anti-static entry mats also feature a rubber bottom that grips the floor to prevent slipping. 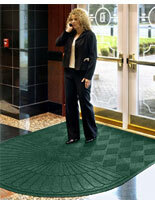 The carpets' polypropylene fabric resists the growth of mold because it dries quickly, making them an ideal fixture for public areas like lobbies. 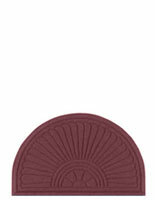 The entry mats measure 3' x 5.5' and have a rounded oval end with a pedal ridge design. 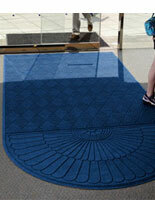 The area rugs' raised pattern creates a tight grip between the fibers and the soles of shoes.